I have always wanted to drive a Ranger Rover, having grown up in the 80s where a Jag and a Ranger Rover in the garage means you’ve arrived. 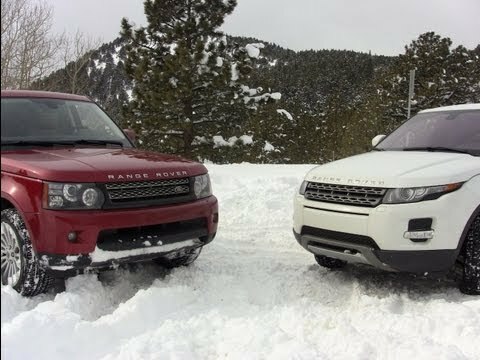 Now I know perfectly well that the Range Rover Sport does not sit on the same platform as the Range Rover, which was developed while Land Rover was still owned by the Germans. 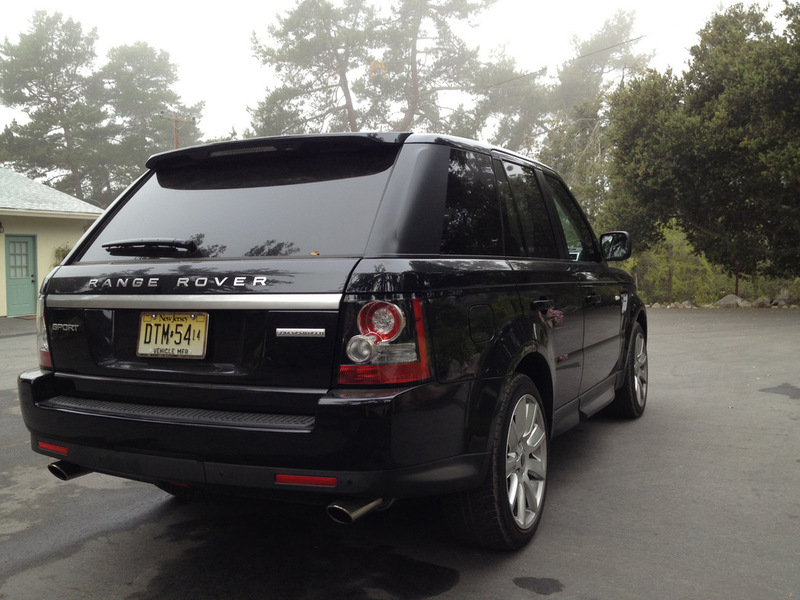 The Range Rover Sport is based on the newer LR4 platform, so the way I see it: it looks like a Range Rover, smells like a Range Rover, runs faster than a Range Rover, makes me feel superior than every other driver on the road like a Range Rover. 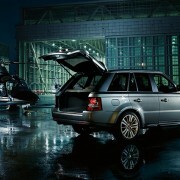 Hence, it’s a Range Rover. 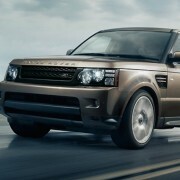 The LR-V8 5.0 liter supercharged petrol engine delivers 510 hp and 461 lb-ft torque. It can get to 60 MPH in 5.9 seconds. That’s right, you read correctly, 510 horses. Unfortunately, the gross vehicle weight is 6,889 pounds on the RRSS. Acceleration is simply marvelous, but you definitely feel the weight of the SUV and can hear the supercharger working hard. Off-the-line acceleration is great at stop lights. People simply don’t expect this hunk of metal to move that fast. Stopping power is also impressive, the Range Rover Sport comes with high performance brakes developed jointly with Brembo. The RRSS also comes with a slew of advanced systems such as Adaptive Dynamics, Dynamic Response and the Terrain Response systems, making this one of the best handling SUV in production. Oh sorry I was just reading the press release. The truth is, the RRSS handled really well on surface streets, the steering felt fairly tight at local speeds and the SUV cornered well. Handling on the freeway was a different story. The steering felt too loose and there was too much give at highway speeds for my comfort. An awesome feature on the highway is the adaptive cruise control (ACC). You just set it, and forget it! Well, you still have to steer, but the Range Rover Sport Supercharged basically drives itself, keeping a preset distance from the car in front of you. 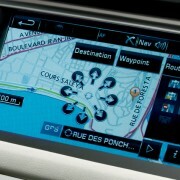 You can also select from three distance settings, depending on the prevailing speed at which traffic is moving on the freeway. It is really cool to experience the car brake on its own when using the ACC. It’s almost like that Lexus prototype in the creepy futuristic movie where Tom Cruise is trying not to overwhelm even himself with his great acting. 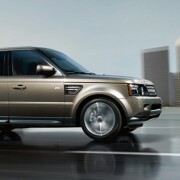 The Range Rover Sport Supercharged has a number of styling cues that set it apart from the lesser HSE and the base model, but overall the styling has not changed much at all since Land Rover first introduced the Sport. The headlamp units look more sophisticated and the new more sophisticated corporate grille give the RRSS a more stately presence. 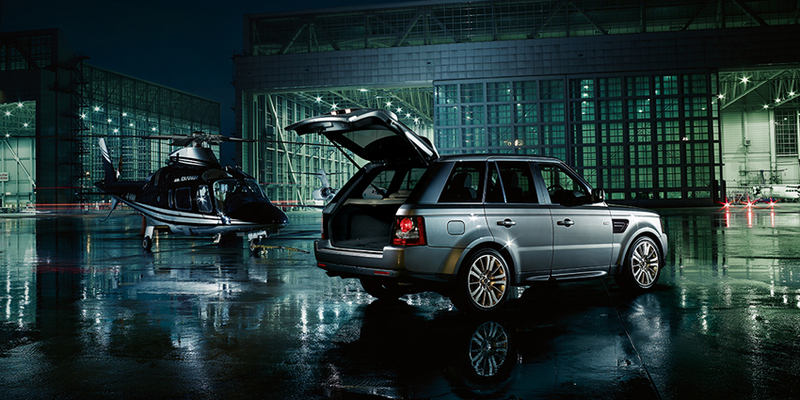 From far away, it’s hard for one to tell the RR Sport from the taller Range Rover. The raked rear window gives it a sportier look and feel, and the streamlined port holes also set the Sport apart from the top of the line badge wearer. I’m not a super big fan of the raked rear window, however. 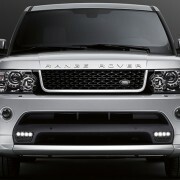 Land Rover should have made the front windscreen (is that what they call it in the UK?) more aerodynamic as well like the new Evoque. 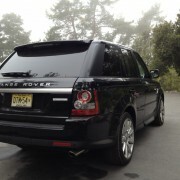 The thick bonnet on the Range Rover is also signature and works well on the Sport. The Supercharged version also has curvy skirts under the sides of the car that make the SUV look lower, even without you lowering the ride height using the air suspension control. It’s pretty cool to feel the vehicle height lower and rise, by the way. 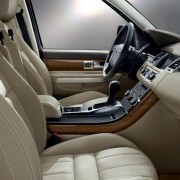 The 2010 Range Rover Sport has a revamped and upgraded interior to bring it closer to its more expensive sibling. The materials feel expensive for the most part but the actual controls, buttons and knobs feel plasticky for a $80k+ car. The steering wheel controls provide an extensive set of controls, from phone controls, voice commands, cruise control and adaptive cruise control, to stereo and info menu controls, it’s all right there at your fingertips. And then you find the paddle shifters behind the wheel. I must admit, these are kind of awkward on a SUV this size. 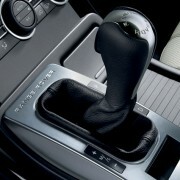 Plus the 6-speed transmission with CommandShift responds to driving style and conditions and dynamically changing shift patterns, so you don’t really need to use the paddles. 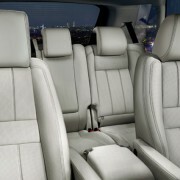 The Range Rover Sport has a lot of interior room. 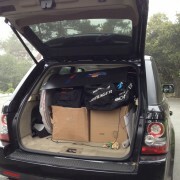 Not as much as the exterior dimensions would suggest, however, but ample room for all five passengers. The center armrest opens up to reveal a refrigerated cooler. Luxury! 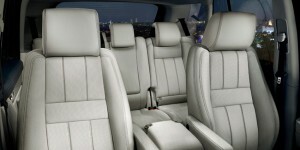 The rear passengers are treated to dual LCD displays with wireless headsets to enjoy DVDs and music. Splendid! Did I mention that the tester RRSS comes with the optional extended leather package that wraps the entire dashboard, the armrests and the top of door panels in premium Windsor leather. It’s all very bourgeois. 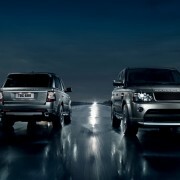 Or is that too pedestrian a word to describe the feeling you get from driving a Range Rover? 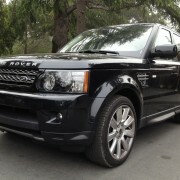 At over $80k, the Range Rover Sport Supercharged is no bargain. 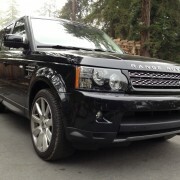 You can get a base Range Rover for that much money. Compared to a BMW X6 M, however, the RRSS is a bargain. Not only do you get more luxury for your money, you also get an extra dose of class that comes only with the venerable British SUV marquee. You can’t get a luxury SUV that’s more unabashedly square, with in-your-face traditional styling that says I come from a more noble birth than you than the Range Rover. 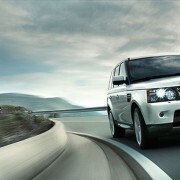 Getting the Sport Supercharged just means you’re not old enough to drive the range-topping Range Rover yet. 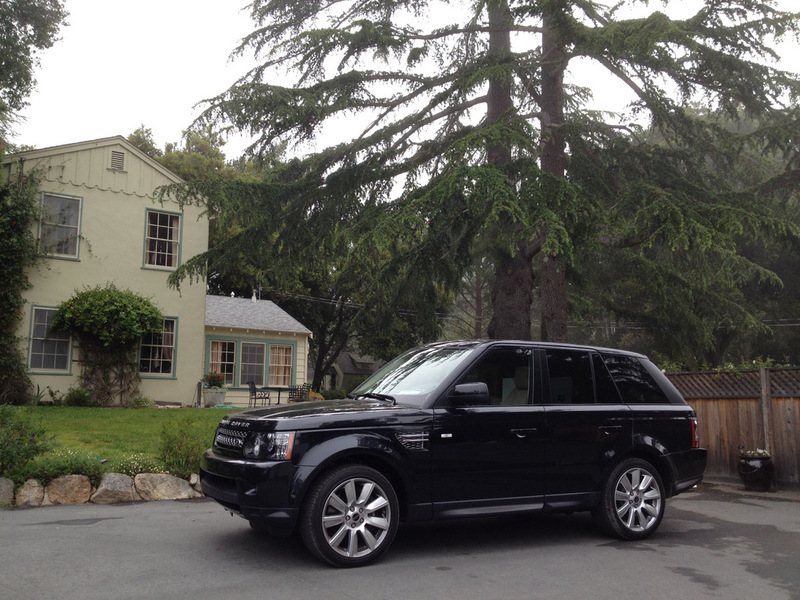 So if you’ve got $80 grand sitting around and you’re looking for a luxury SUV that says you’re better than everyone else, and you’re not sure whether there’s an off chance that you might one day buy your own plantation with dirt roads, the Range Rover Sport Supercharged is for you. I recommend you buy a pair of black riding boots and a tall hat to go with the ride. A smoking jacket and a fake British accent would also go well with the new ride. God save the Queen! It drives magnificently! Ease your fears for sudden stops and quick turns, the 2010 Range Rover Sport now features Enhanced Understeer Control (EUC) to further increase the vehicle’s stability and safety. For example, in a situation where the vehicle is traveling too fast to negotiate a corner, the EUC system will reduce engine torque and, if required, apply braking pressure to reduce vehicle speed. As for the color, I completely agree! 510 hp??? Does it drive ok? I got to try that on the Range Rover and it’s great getting up in speed but one would be scared stopping or turning shortly after a moment with that gas pedal. 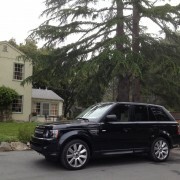 I don’t think Range Rover’s current line up has anything to do with the world we live in now.As much as Bentley and Roll’s do ,except for filling some old reactionary Republicans garage.I don’t like these cars and have many neighbors who who drive used versions of these vehicles .Having a regular $5,000.00 repair bill a couple times a year is ridicules . I hope they move to a mini size SUV is one start but the problem is engines since they don’t build there own and sourcing is going to be weird.I think 2011 Grand Cherokee is a better SUV and less then half the price and the new 2011 Explorer is set to be what LR’s were meant to be.TATA has some work to do and my suggestion is just to shut it down.